There were meant to be 700,000 locals in Nizwa, and I couldn’t see even one of them. Now I knew what it felt like being in a ghost town. A town where the sun, and the hairdryer-like heat drove the humans indoors. I sat on the gun carriage of an old canon, in front of the door to the fort. 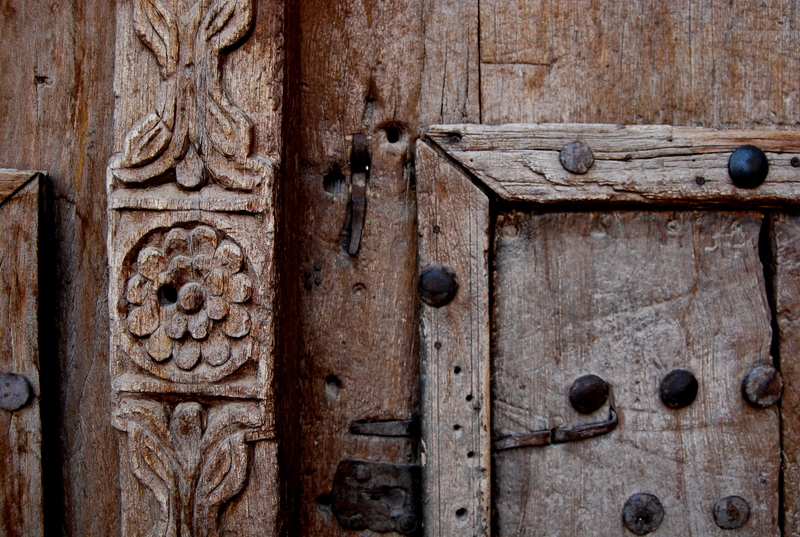 The door was heavy, wooden, with some floral carvings, and giant nail heads that looks like blackened coins. I sat clinging to the shade, and my camera, and did not want to move. It is fair to say I felt anxious at the thought. I’d long been a shadehunter in my skin-cancer-susceptible Australia but this was more intense. It was so hot that afternoon in Nizwa that I just wanted to sit at that door until the sky turned to blue ink and the moon came up. Walking the streets here in this old capital city was meant to be filled with adventure, exotic, romantic even. It wasn’t meant to be a game of walking in the grey shade to avoid sun that was bouncing off the biscuit-coloured walls. It wasn’t meant to be 43-degree heat. I wondered if locals were in their houses, getting up from reclining with a cup of coffee and bowl of dates, peeking out from behind shutters at us, and quietly smiling and chuckling. I just hoped they didn’t think us mad dogs or Englishmen. Behind me, a fort built in the 1600s. 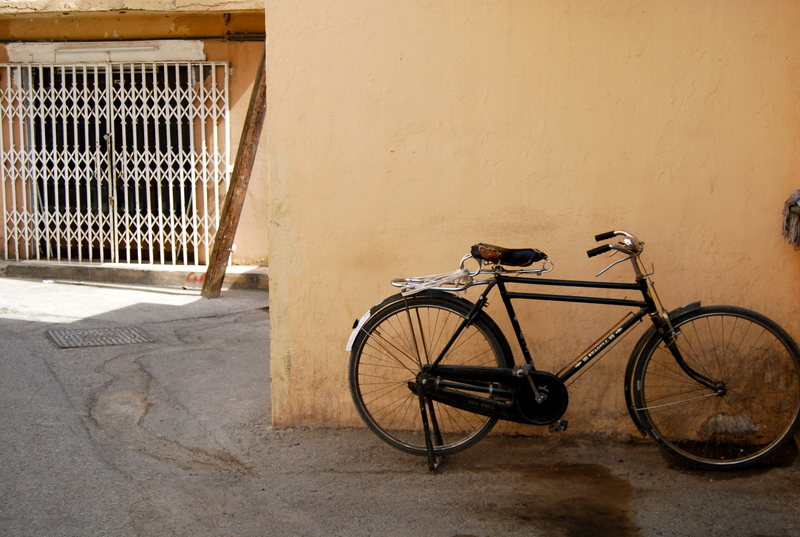 To my right, there was a bicycle leaning against the wall – a sign of life. Someone had to have put it there. Someone had to use it to sail the streets of this ghost town. In the other direction, the edge of the souk and dozens of earthenware water jugs for sale, displayed on what looked like large hatstands, the jugs like dangly earrings. Why did I wear black? Because I thought it would be practical, and not show up any grottiness collected from travelling in this dry and dusty world. I was wearing a long skirt that covered my legs – I’d read the guide books – I knew how not to offend. My blonde hair might look like a rare bird in these Arabic streets, but my pale legs would not. I was safe and happy in the shade. My stomach was starting to talk. It had been a long time since that boiled-egg-and-hummus breakfast at the hotel in Muscat. I’d have to leave the shade to eat. “Come on” my travelling companions said. “Ok” I said after a deep breath of hot, dry air. “But we find somewhere to eat by car – not walking – and we don’t turn the air-conditioner off”. I’d purchased green air miles, or whatever they are called now. I’d bury my environmental guilt in the bottom of the suitcase for now. After driving around the Nizwa looking for an open shop that looked to serve food, and one companion explaining, as he navigated the car, the conventions of not touching women before prayer, we found somewhere. It was not near the other shops, and was close to where the goats are sold at market as they have been for hundreds of years. It was open, there was a carpark out the front, and I could see air-conditioning units attached to the building. Walking into that restaurant – that 80s-interior but oh-so-clean restaurant – was the closest I experienced to finding an oasis that holiday. It was air-conditioned, to the extreme, and I could sit on the floor with cushions, take my shoes off to wriggle my toes that had grown chubbier in the heat. We sat quietly to begin – it was like our bodies needed to mediate and reboot. We were in a ‘family’ room – a giant dining cubicle with walls but no ceiling– because we were a trio of two women, and one man. Next door we could hear children and parents talking in Arabic, while we spoke in English, with Pakistan, Dutch-Romanian, and Australian accents. We talked about what we would do later. We talked about never leaving our air-conditioned private dining room. In truth, we knew the temperature would barely drop in the evening. The door to the room opened, in walked a smiling man with a tray the size of a hula-hoop. We shuffled back towards the walls to make room, and the man put the tray down in the middle of us, like how a UFO lands in the movies. On the silver tray were small plates of olives, hummus, bread, tomato salad, lamb. Food to share. Eat slowly, I thought, for when it is finished, the game of walking in the grey must begin again. But I wouldn’t have wanted to be anywhere else. Words from memories of travel to Oman in 2011.